What does the marketplace offer? Because your luxury home should be a true reflection of your distinctive tastes and lifestyle, it is important to invest the time to explore all options during your search. Too many buyers visit only a few luxury properties, make an offer and sign on the dotted line, only to find a more fitting option just around the corner. 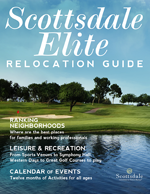 It takes several months to explore everything the marketplace has to offer, from a Scottsdale luxury home, a Scottsdale gated home, and luxury real estate in Scottsdale to a gated home in Arizona or an Arizona luxury estate. With Exclusive Arizona Buyers Agents as your partner, you are assured a broad range of listings from multiple sources that only an experienced buyer’s agent can access. Your investment of time can lead to your best investment in Arizona luxury real estate.